Do you know the story of the Nutcracker and the Mouse King? Today’s outfit was inspired by the story of the Nutcracker. It’s a cozy Christmas Eve at the Stahlbaum’s house. As the Stahlbaum’s prepare for their annual Christmas party, their children, Fritz and Clara, wait anxiously for their family and friends to arrive. When the guests finally appear, the party picks up with dancing and celebration. A mysterious guest arrives dressed in dark clothing, nearly frightening Fritz, but not Clara. Clara knows he is Godfather Drosselmeyer, the toymaker. Drosselmeyer reveals to the children that he has brought them gifts. Fritz is given a beautiful drum, but Clara is given the best gift of all, the Nutcracker. Fritz grows jealous, snatches the Nutcracker from Clara and plays a game of toss with the other boys. It isn’t long until the Nutcracker breaks. Clara is upset, but Drosselmeyer fixes it with a handkerchief. The party grows late and the children become sleepy. Everyone generously thanks the Stahlbaum’s before they leave. As Clara’s family retires to bed, she checks on her Nutcracker one last time and ends up falling asleep under the Christmas tree with the Nutcracker in her arms. At the stroke of midnight Clara wakes up to a frightening scene. The house and the toys are getting larger. Out of nowhere large mice dressed in army uniforms, lead by the Mouse King, begin to circle the room while the toys and Christmas tree come to life. Clara’s Nutcracker groups the soldier toys into battle formation and fights the mouse army. Clara makes a desperate move to save her Nutcracker from defeat and throws her slipper at the Mouse King. The Nutcracker is able to overcome the stunned Mouse King and claims victory. The mice army quickly carries away their King. Clara falls onto the Nutcracker’s bed, over-whelmed by the moment. The Nutcracker is transformed into a human prince.He gets on Clara’s sleigh and drives through a snowy forest where the snowflakes turn into dancing maidens. She tells the Nutcracker she wishes the adventure would never end and he tells her it won’t for those who have an eye to see it. 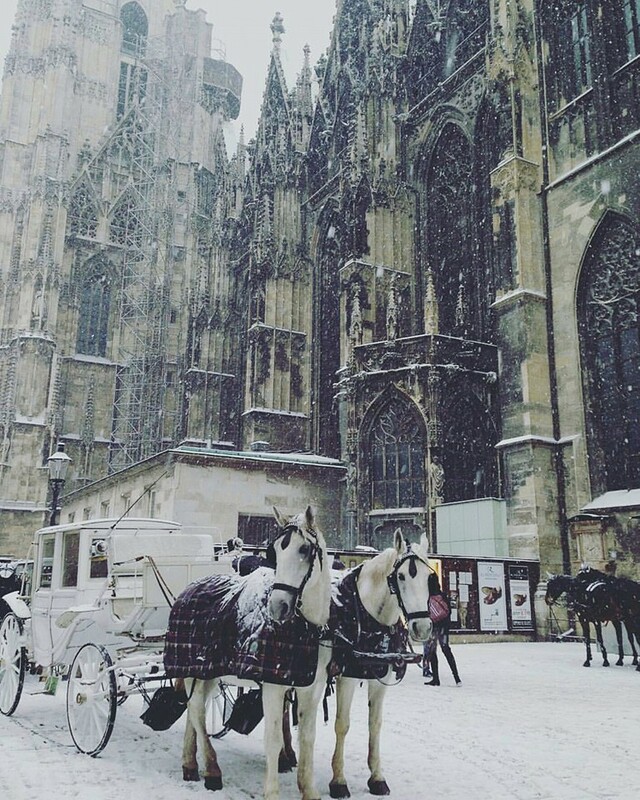 P.S.Two days ago,Vienna was covered in white sugar. The snow make it look like a fairy-tale place. The snow is long gone now…but I managed to take a shot of this dreamy place.